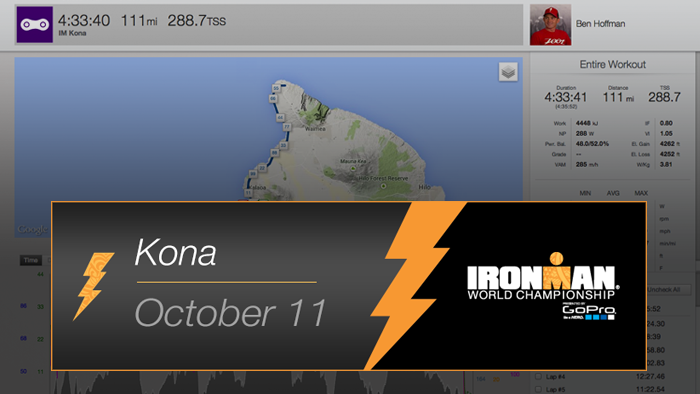 The IRONMAN® World Championships showcase some of the fittest athletes in the world. We took a look at some of the top professional men and women, as well as age groupers, to see what type of numbers they put out over 112 miles. 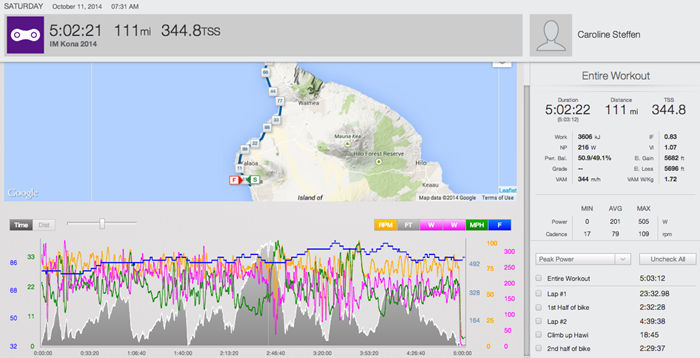 Up Hawi, Van Lierde average 345 watts, or 4.8 W/kg. Van Lierde pushed an average of 286W over the last 30 minutes of the ride. His cadence was steady at 90 and 91 rpm for both of these sections. Twelsiek put out 304 watts over the first 56 miles and burned 2445 calories. 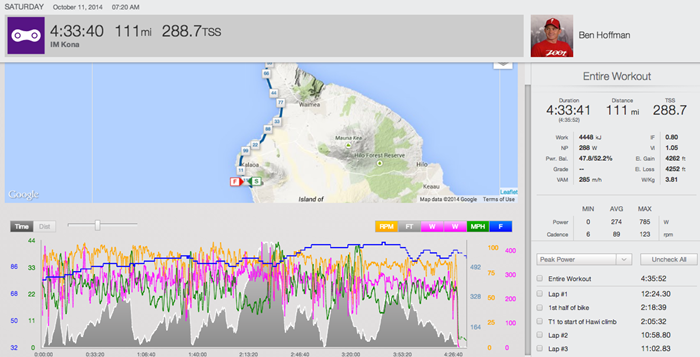 Climbing and descending Hawi, Twelsiek averaged 292 watts over a 30 minute span. Twelsiek averaged 40.4 kph (25 mph), in the final 32 miles after Kawaihae. 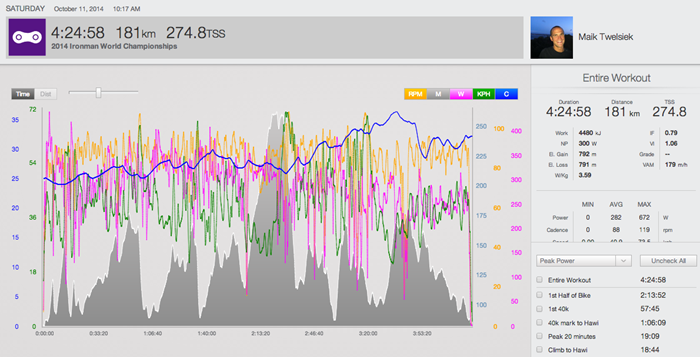 Alexander set his peak 20 minute power right at the start by averaging 269 watts, or 3.95 W/kg. Over his 4:40 bike, Alexander burned 3883 calories. In the first 56 miles Alexander averaged a cadence of 95 rpm and kept that steady averaging 93 rpm over the back half. Buckingham pushed early, averaging 284 watts, or 4W/kg., for the first half of the bike. This effort was big and Buckingham dropped to 245 watts, or 3.45W/kg, over the last half. 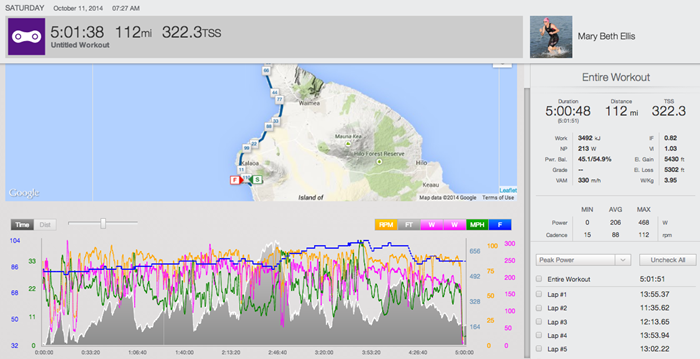 Steffen’s peak 1 hour power came in the early miles along the Queen K and she averaged 226 watts while going 22.3 mph. Like many pro women, Steffen prefers a bit lower cadence averaging 79 rpm. Over the full 112 miles Steffen burned 3606 calories and averaged 22.1 mph. 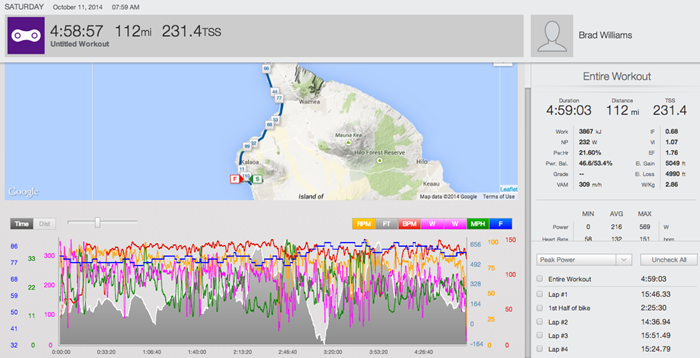 Ellis went up the climb to Hawi averaging 213 watts, or 4.08 W/kg, at 15.5 mph. 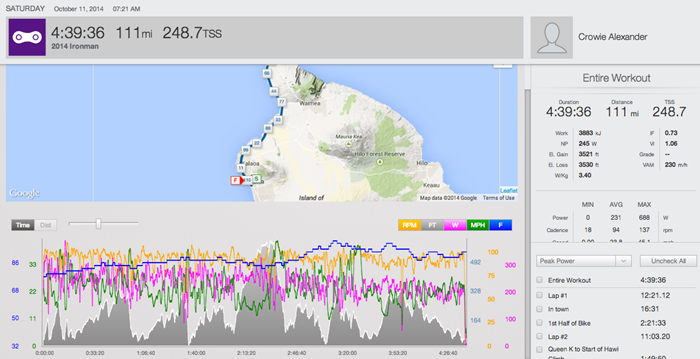 On the short climb up Kawaihae, Ellis averaged 208 watts, 3.99 W/kg. Her peak 20 minute power came at miles 42 through 50 where she held 239 watts. Williams averaged 216 watts and 22.5 mph to dip under the 5 hour mark on the bike. His peak 20 minute power was set early and he pushed 264 watts. 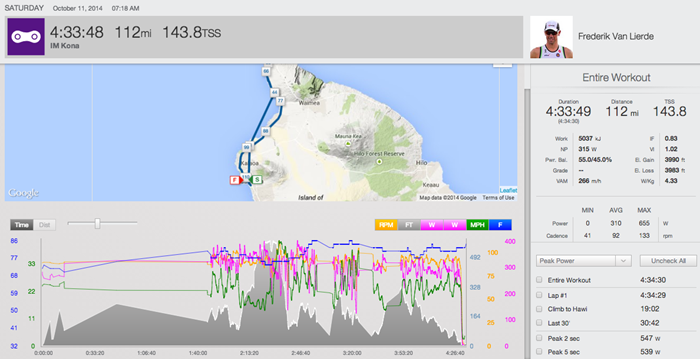 Williams hit his peak speed of 43.2 mph and peak cadence of 114 rpm coming down Hawi.